here, and we would ask for a photograph to support your record. We therefore ask that you to register and then be logged-on to do this. Zoropsis spinimana (Dufour, 1820) is a Mediterranean species. 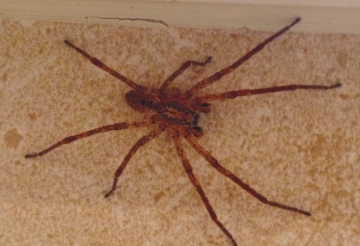 Despite the fact that this spider is large enough to be intimidating and is one of the very few spiders in Europe which can penetrate the human skin with its chelicerae and produce a painful bite, it is harmless to humans and bites are unlikely. Zoropsis spinimana has been well established in the London area since at least 2012 and with an older photograph as far back as 2008, with other records from Sussex and Andover. It seems unlikely that Zoropsis spinimana could survive long-term outdoors here, but it could live indoors and occasionally venture into gardens in the summer (Peter Merrett, pers. comm.). We would like your help in recording and monitoring its presence and spread in and beyond London. Zoropsis spinimana superficially looks rather like a large lycosid wolf spider. Like these Zoropsis spinimana is a hunting spider which does not spin a web or use silk to subdue prey. Its silk is used primarily by the female to cover her egg sac. Like most spiders, its diet is primarily insects; however there is very little information available about the biology of this spider. Adults 3/4" in body length and 1-1/2" to 2" long including legs. Eight eyes arranged in two rows of four, which gently curve toward the rear of the body. 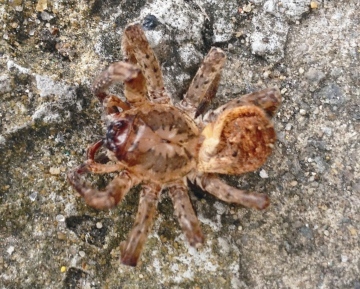 Light to Dark brown, peppered with grayish spots on the legs and abdomen. On the dorsal side of the abdomen, there is usually a dark pattern that flares outward two or three times before constricting to a pointed end. 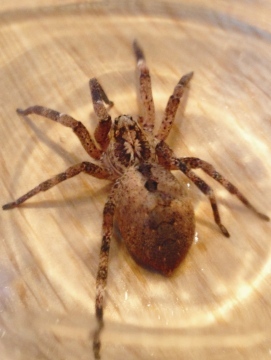 Zoropsis spiders look like wolf spiders but have much smaller eyes. There is also some evidence that Zoropsis spinimana has already been spreading northwards in Europe. In Oct. 1997 a female Zoropsis spinimana was found at the wall of a house in Innsbruck, N. Tyrol, and since non-adult specimens had also been observed in S. Tyrol, Thaler & Knoflach (1998) suppose that Zoropsis spinimana may be an expansive species and a recent addition to the urban fauna of Austria. Wittenberg (2005) states that the first record in Switzerland of an individual caught in 1994 in a residential house in Basel, with other records since reported from houses in the south of Switzerland. Hänggi & Bolzern (2006) report the first two records of Zoropsis spinimana in Germany, together with a further discovery of the species in Central Switzerland. A spreading of the species from South to North along traffic routes is supposed and climate change is suggested as a possible reason for the species establishing itself in Central Europe. Griswold & Ubick (2001) document the species establishment in the San Francisco Bay area in the USA since at least 1995. The California Academy of Sciences has been monitoring the spider's spread on the Bay Area’s Most Wanted Spider website. Zoropsis spinimana was first reported in California from the Sunnyvale area of Santa Clara County in 1992, since when the spider has mostly spread north and east around the San Francisco Bay area with specimens found throughout Santa Clara, San Mateo and Alameda Counties.